I’ve been craving savoury salty foods lately, perhaps because I’ve been eating too many fruits, sweets and other extremely Yin foods??? The concept of Yin and Yang is an ancient Chinese philosophy of balance through polar opposites. Yin is expanding energy while Yang is contracting energy; Yin is feminine while Yang is masculine; If Yin is humid, night, relaxed, rested, then Yang is dry, day, focused and active. Foods are also described as being Yin or Yang with sugar, alcohol, fruit, sweets, and oil being extremely Yin along with fresh dairy products, while salt, toasted or roasted foods, baked goods, meat, eggs and such are considered extremely Yang. When I had my honey moon with macrobiotics I learned all about balancing your diet according to the Yin Yang philosophy and while I no longer practice macrobiotics in the strict sense, some concepts really resonated with me and have stuck for life. One such concept is that most vegetables, whole grains and beans are considered to be well balanced and when we focus our diet on these foods we will in turn feel balanced. That said I’ll be the first to admit that I’ve been having sweeter than usual breakfasts lately and perhaps one too many tasty treats throughout the day as a result of all my recipe testing #foodbloggerproblem. The other morning, on my dedicated study day, I woke up with a craving for a savoury breakfast. Rather than turn to my usual porridge, which is typically the breakfast solution, I decided to take advantage of a day at home to whip up my tempeh breakfast scramble. I rolled it into a wrap with avocado and it really hit the spot. It kept me satiated a while, and I didn’t have lunch until well after 2pm, but when I did, I used the leftovers to create a lunch salad. Two birds with one stone and two very different meals using the same recipe. Here’s the recipe and method to both the wrap and salad. 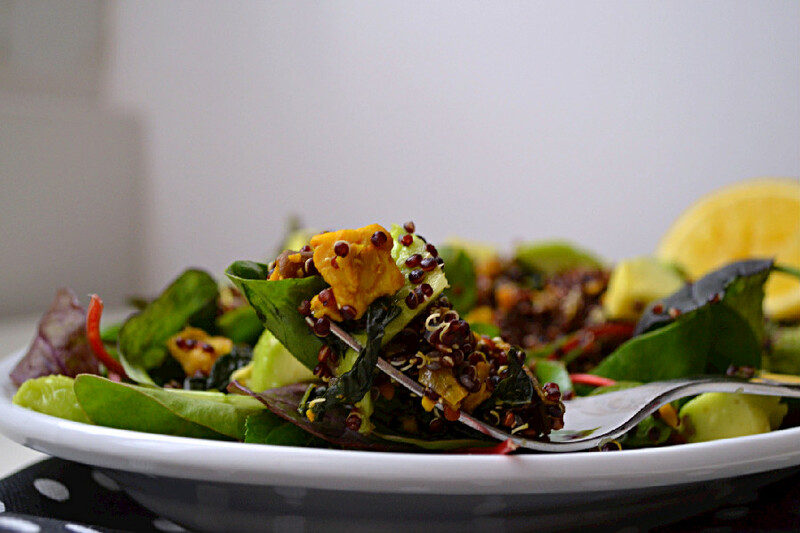 This recipe makes 2 small wraps or 2 salads, or 1 small wrap and 1 salad. If you want to know more about Tempeh, read this post or this one. 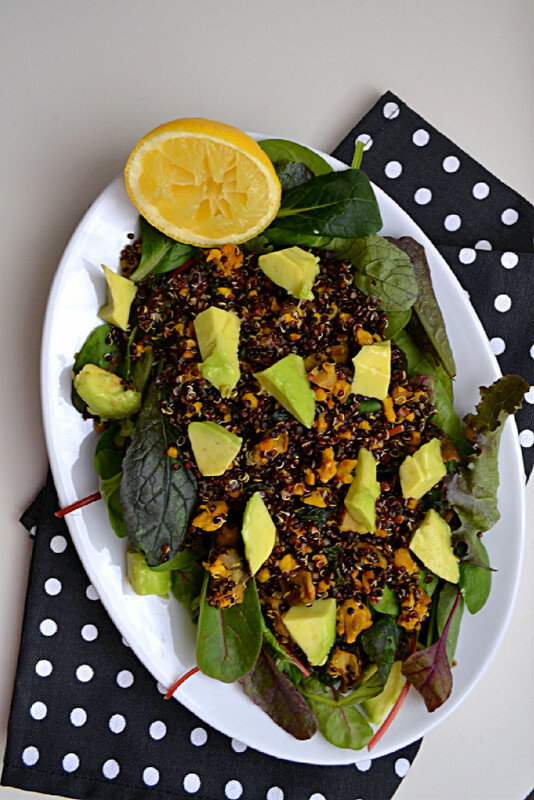 For more information on Quinoa and how to cook it perfectly, see this post. Note:if you have a soy allergy, you could replace the tempeh with a 1/2 C of cooked chickpeas, coarsely mashed with a fork. Add Herbamare, tamari, water, kale and mushrooms and sautee on medium low setting for about 15 minutes until mushrooms are softened. Add a few drops of water if necessary. Add nutritional yeast and cook for an additional 5-7 minutes. At this point, the mixture should be moist but not wet, as all the water and liquid from the mushrooms should have been absorbed or evaporated. Test for readiness. Tempeh should be slightly browned, soft but not mushy. 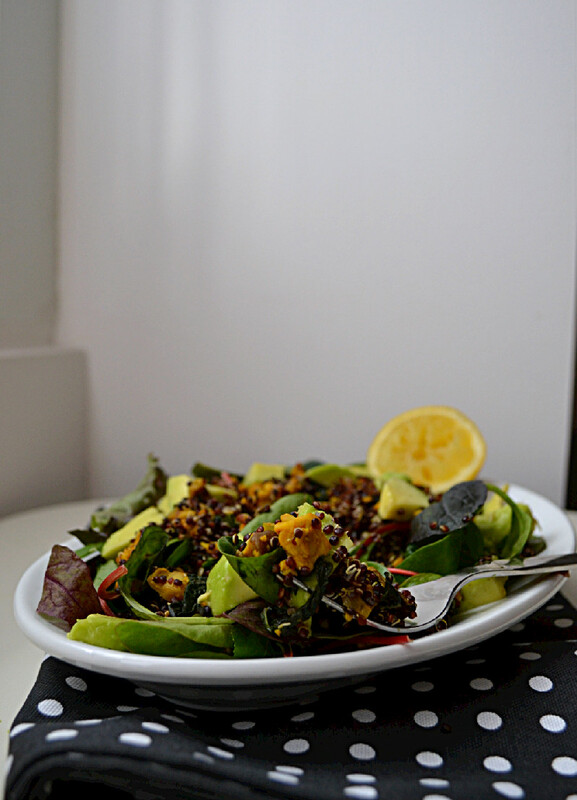 To make a salad: Place mixed salad greens of choice on a plate, top with your favourite cooked grain (I used cooked black quinoa, about 1/3 C uncooked quinoa makes two servings cooked), Tempeh Scramble, 1/4 sliced avocado and fresh squeezed lemon juice to taste. Brunch Plate: Serve with oven roasted sweet potatoes, toast, and a side salad. Yum, these wraps look so good! !